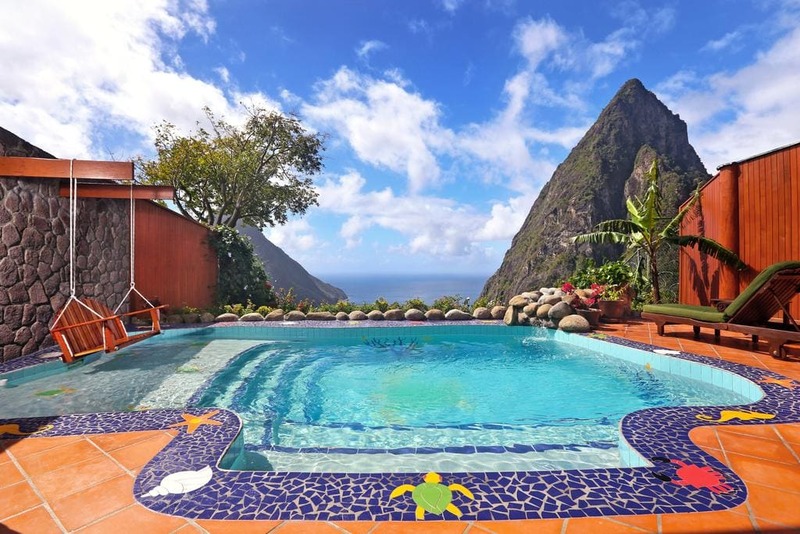 Open-air suites at this intimate St. Lucia resort feature private plunge pools overlooking the Pitons and Caribbean Sea. The Suites at Paradise Ridge are the newest rooms at the resort and feature butler service. Located at the site of a former cocoa planation, Ladera Resort overlooks the Pitons and the Caribbean Sea on St. Lucia’s southwest coast. The intimate, adults-only resort has 37 open-air rooms, each featuring natural stonework, hardwood floors, and locally-sourced furniture, plus private plunge pools (some with swings and waterfalls). Each room has a safe, mini-bar, coffee maker and free Wi-Fi. The resort’s restaurant, Dasheene is open daily for breakfast, lunch, and dinner, with a full menu available poolside. There’s a Wine Cellar for wine tasting and private dining, and a bar overlooking the Pitons. Resort amenities include a spa, a free shuttle to Sugar Beach, and a concierge to book island activities like hikes, sailing and ziplining. What’s nearby: Soufriere is a 10-minute drive from the resort. St. Lucia’s Hewanorra Airport (UVF) is 15 miles away. For more information, visit Ladera’s website.